When it comes to marijuana, the Elizabeth Warren of 2012 would probably not recognize the Elizabeth Warren of 2019. Seven years ago, Warren opposed legalization. In 2015, the senator from Massachusetts said she was “open” to it. In 2016, she said, she voted for it privately at the ballot box. Now she’s one of marijuana’s top cheerleaders on Capitol Hill, championing a measure to protect the pot industry in states where it’s legal. Warren’s evolution is not unique — in fact, 2020 will see the first presidential race in which every candidate, at least so far, favors some path to legalization. All 12 official Democratic candidates, as well as the potential Republican hopeful and former Massachusetts governor William F. Weld, told the Globe they now support full nationwide legalization, Canada-style. President Trump, meanwhile, has said he supports states’ rights to legalize. 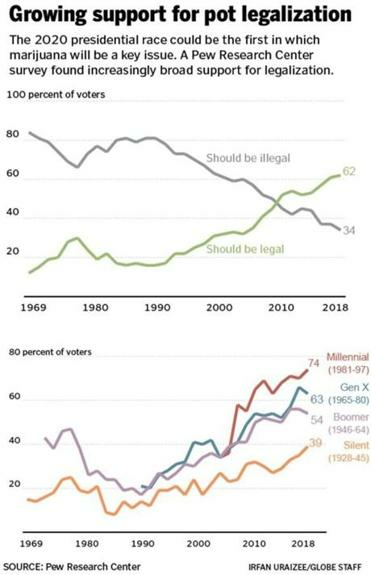 For Democrats, especially, being for cannabis legalization might be as much of a litmus test in 2020 among voters as supporting abortion rights. But they must face their past stances with honesty, political strategists say. In 2008, now-Senator Kamala Harris touted her high conviction rates for drug dealers as a district attorney, and Joe Biden, the former vice president — who is likely to run, but hasn’t announced — was long an evangelist for the war on drugs. The political sea change has followed public opinion: About 62 percent of Americans want marijuana to be legal, almost double the 35 percent who said so in 2008, according to the Pew Research Center. In addition, political analysts say, the changes in candidates’ views were driven by potential tax revenues and job creation, the popularity of reducing mass incarceration, and an aging population interested in the potential medical benefits. Ten states — including Massachusetts, Maine, and Vermont — and the District of Columbia have legalized marijuana. That means one in four US residents lives in a place where the substance is legal, according to a Globe analysis of census data. Now politicians, particularly Republicans, have a more politically safe way of supporting marijuana: by advocating for states’ rights, said Steve Fox, a cannabis lobbyist with VS Strategies. “At this point, the greatest driving factor at the federal level is simply the fact that it’s legal in so many states,” Fox said. To combat the rising momentum, the antilegalization group Smart Approaches to Marijuana is producing a guide for candidates that it says will be backed by medical associations. “Candidates will have a simple choice: They can either follow the pot lobby or they can follow the science,” said executive director Kevin Sabet. On the Republican side, Weld has long been for marijuana. But Trump himself could preempt all competitors by using an executive action or signing a bill into law, like the one sponsored by Warren that would ease the industry’s concerns about federal targeting of state-licensed businesses. But now with a new attorney general — William Barr testified he would not “go after” legal pot businesses — and Democrats in control of the House, Washington politics may have changed just enough that there could be action soon. Along with passing a large infrastructure bill, loosening marijuana restrictions might be one of the few subjects on which there is bipartisan agreement. Senator Cory Booker of New Jersey, who has made legalization a core part of his presidential campaign, said his position has much more to do with addressing racial disparities in policing than it does with freedom for recreational use. The potential 2020 candidate who has most publicly evolved on the issue is Democrat John Hickenlooper, who as Colorado’s governor fought against the campaign for his state to become the first to legalize adult recreational use. He has since found his fears of increased underage use to be unfounded, and legalization has dramatically undercut the black market. While campaigning in New Hampshire, Warren said she believes marijuana should be fully legal nationally, but her bill with Colorado Senator Cory Gardner, a Republican, reflected the political reality in Washington. But don’t expect many candidates to focus their campaigns on marijuana. It’s not just safe now — it’s too safe.